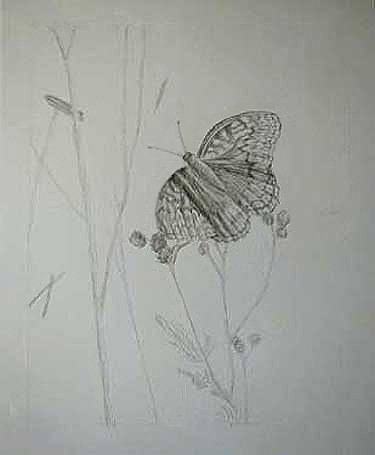 Daily Sketcher - Butterfly in dense foliage: Heavy drawing paper, Mechanical pencil, 9" x 12", started 11-17-09. I choose to start with the butterfly. I roughed out the location, shape, and size of it then began adding a bit of its detail. I did not plan to get into the details so early but wanted more time to think about how to sketch the background. The butterfly is in dense foliage which is fairly light in value. I might try shading the background and pull out the foliage with an eraser. It was easy to get drawn into the details of the butterfly; it has the most amazing markings. I also discovered upon closer inspection, that the wings appear to fold like an accordion with the lower part of each wing having approximately twice the number of folds as the top part.